Is Being A Tipster Easy Money? 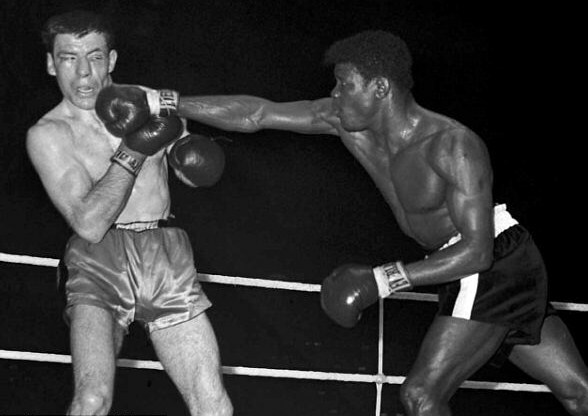 It had been 18 years since Ronnie James from Bonymaen had bravely but unsuccessfully challenged Ike Williams from Trenton, New Jersey for the World lightweight title on a wet evening at Ninian Park, Cardiff to become the first and only Swansea boxer before this night to challenge for a World title. 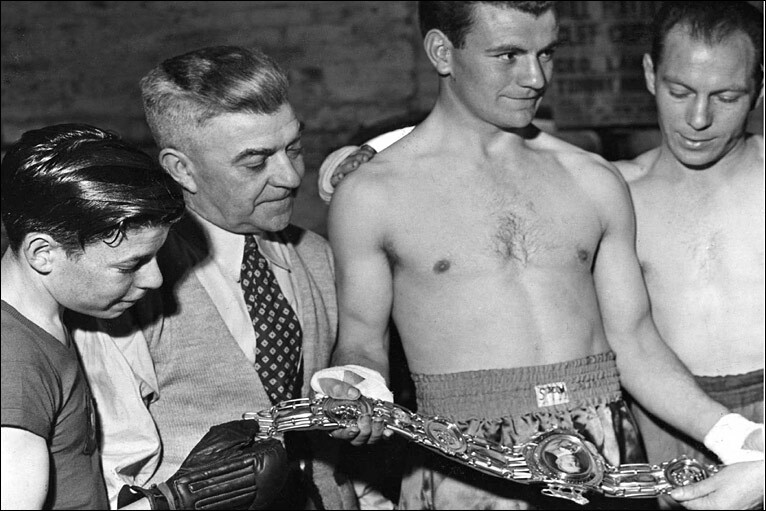 Brian, under the supervision of his brother and manager Cliff, trainers Dickie Dobbs and Andy Smythe had prepared meticulously to go one better than Ronnie and be the first boxer to take a World title home to Swansea. No one underestimated the challenge that lay before Brian. Griffith a milliner by trade from the Virgin Isles but residing in New York was 26-years old, a few months younger than Brian but already with a wealth of experience. Turning professional in 1958 and managed by Gil Clancy he had won 40 of 46 professional contests and making the second defence of the title he had regained from the Cuban gladiator Luis Rodriguez. To date he had participated in 10 World title fights, winning eight. 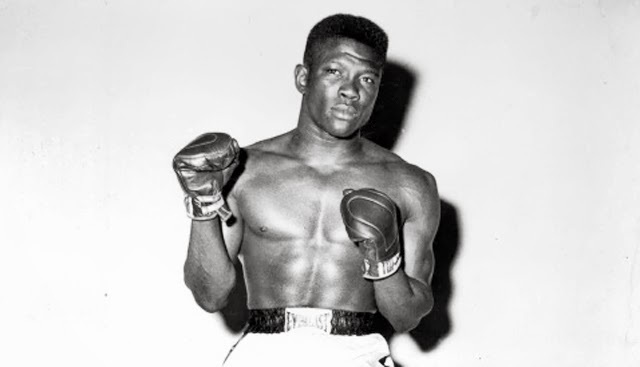 Emile Griffith first became welterweight champion of the World in April 1961 when he knocked out defending champion Cuban Benny Paret but lost the title in a return bout on a split decision six months later. Champion Paret and challenger Griffith met for an ill-fated third time at Madison Square Garden in New York in March 1962. This was a genuine grudge match that ended tragically in round 12 when referee Ruby Goldstein stopped the contest when the Cuban was not responding to a two fisted onslaught from the Virgin Islander. 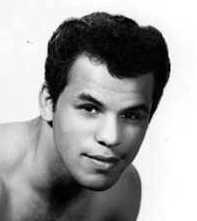 Benny Paret slipped into a coma and died several days later from injuries sustained in the fight. The new champion made two successful defences of his title before losing his crown for the second time to Rodriguez. After he had regained the title from the Cuban he agreed to a defence in London against the Welshman. Brian Curvis was from Peter Street in Waun Wen. His father Dai had mentored brothers Cliff and Ken to careers within the paid ranks of boxing and Brian turned professional on 2nd June 1959. Coming into the Griffith fight he had engaged in 31 contests winning all but one when he sustained a loss because of an eye injury, that defeat was later avenged against Guy Sumlin from Mobile, Alabama. Between the two Sumlin contests Brian had established himself as a leading contender for the World title when he achieved a memorable victory over the highly ranked and very experienced Ralph Dupas from New Orleans, Louisiana. This was without doubt Brian’s finest performance. The American was floored in the first round by a terrific left hook after that it was all about survival for Dupas. He was later disqualified in the sixth round for persistent holding which was the only tactic he could deploy in an effort to contain the relentless bombardment of high quality punches from the Swansea boxer. 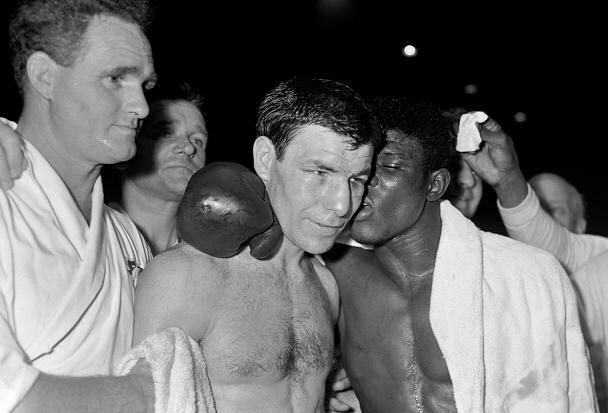 Victories over Sumlin, Tony Smith, Maurice Auzel and Sugar Cliff kept him fight fit and enhanced his reputation as he steered closer and closer to a tilt at the World title. In March 1964 Brian engaged in a 'warm up' contest before his eagerly awaited World title shot when he boxed British, British Empire and European lightweight champion the 'Dartford Destroyer' Dave Charnley who made things very hot for Brian. It was a tremendous battle of two southpaws over ten rounds that ended with Brian being adjudged the winner by what must have been the narrowest of margins. His final appearance before his World title challenge was a defence of his British and Empire titles with a comfortable victory over Johnny Cooke from Bootle who was stopped in the fifth round. Brian’s professional career began when he halted Harry Haydock in two rounds at Wembley in June 1959. He was the role model for every young Swansea boxer and carried the hopes of all Welsh fight fans into the Wembley arena. Many believed that Brian would be too good for the World champion proving perhaps that belief emanated from the heart and not from the head.The time had come the challenger was entering the ring amidst a huge roar from the partisan crowd followed by the champion who appeared as cool as a cucumber. Brian, the first British boxer to challenge for the World welterweight title since Ernie Roderick lost to Henry Armstrong was conducting himself ambitiously, taking the fight to the champion in the early rounds. He was having some success with a left cross but Griffith was getting through with heavy body blows that would surely take their toll in later rounds. Going into the sixth round the champion was winning most of the rounds not by big margins, but toward the end of this round the champion floored the Swansea boxer for a count of eight with a viscous right hand to the body. At the end of the round Brian returned to his corner with a swelling over his left eye and a forlorn look on his reddened face. In round seven Griffith growing in confidence was now looking a very dangerous opponent, although the Swansea boxer did connect with two good right hands toward the end of the round but the champion seemed undeterred. In the following few rounds the Virgin Islander took total control of the fight and in the tenth round floored Brian for a second time he was now asserting his dominance of his gallant challenger. In round eleven the champion clearly had aspirations to terminate the contest inside the scheduled 15 rounds, but toward the end of the round, the tiring Welshman succeeded with two good lefts to the champions head. Brian enjoyed more success in the twelfth and had given the crowd reason to cheer him on through the final rounds. Griffith seemed a little bemused wandering from where Brian had found a new source of energy, which he carried into the thirteenth until his tormentor landed a breathtaking right to the solar plexus which sent Brian to the canvas for the third time. The champion had found a new spring in his step just when it looked like Brian was making some headway although in reality his only chance of winning at this stage of the fight would have been by knockout or disqualification. Griffith had been warned several times by referee Harry Gibbs for careless use of the head. In the fifteenth and final round the challenger had found some fuel in his depleted tank to stand toe to toe with the champion right up to the final bell. The champion even sustained a cut over his left eye and he knew he’d been in a fight. At the final bell the referee had no hesitation in raising Emile’s hand as the winner but there was great applause for Brian Curvis for his valiant effort and a show of respect from a very good champion. Although 50 years ago I, like many other Welsh boxing fans, still have strong memories of the feeling of despair and disappointment that had followed the strong expectation and confidence of success that was present before the first bell. Although well beaten by a truly great champion who would go on to win the World junior middleweight and middleweight titles in a career of 112 contests, would deservedly take his place in Boxing’s Hall of Fame before his death on 22nd July 2013. BRIAN CURVIS (1937 to 2012) who passed away on 9th January 2012 after enduring a long battle with Leukaemia had certainly endorsed his credentials as a worthy challenger. Have just watched the fight again after many years. I could feel the tension you talked of in your piece. Interesting to see that Emile Griffith received £20,000 for the fight and Brian £5,000. Trying to get my head round a boxer with a 44in chest and a 27in waist for a welterweight? Emile did not mind using his head in the clinches did he? Thanks again for your fabulous insight and knowledge, it is great to for us to be able to convey your boxing wisdom.